Summer is right around the corner, which means it’s time for my favorite activity — making lists of all the books I want to read during the summer! Now that I have children, it’s such fun for me to make up lists for them as well and work our way through the books together. It’s a delight to gather new titles and old favorites, buy our own copies or check them out from the library, and then enjoy them over and over and over again during the hot summer months — whether on our porch swing, a beach towel, or with a popsicle in hand. Making summer reading lists also helps make sure that books become a part of our summer memories — when the season ends and we return to a more regular schedule, we can open any of the books from our summer reading list and instantly be reminded of those lazy summer days. We have read this book approximately 50 million times this year and no one in our house is tired of it yet. Choochie Pooh is a tiny little purse dog, but all he wants is to be taken seriously and to play with the big dogs at the dog park. But what big dogs will ever want to play with a tiny little dog called CHOOCHIE POOH?! Summer is the perfect time to whip out the art supplies and this book is a great way to help your children understand that anything can be turned into something beautiful. It’s so fun to watch accidental drops and splotches turn into art. The Circus Ship is one of our family’s favorite books, so we were all delighted to see a new book by Chris Van Dusen coming out this summer. In this one, Hattie draws a great sea monster out of the lake with her singing and becomes friends with it. But everyone else in the town is terrified. Can Hattie make them see that there’s nothing to fear from Hudson? With four little daughters of my own, it’s very important to me that they see examples of women who did brave things and followed their dreams. This gorgeous book by Chelsea Clinton showcases 13 amazing American women who did exactly that. No one does mystical books like Neil Gaiman and this tale, which was originally only available on audio, has now been turned into a gorgeous picture book about a princess named Cinnamon. She doesn’t speak and her royal parents offer untold riches to anyone who can get her to talk. Possible hope finally arrives when a talking tiger appears at the palace. Like many children, Charlotte desperately wants a pet. But when her birthday arrives, her parents give Charlotte a rock. But Charlotte isn’t disappointed — she loves her rock as much as she would a real pet. A sweet and slyly funny story with a surprise twist at the end that will delight you and your little one! 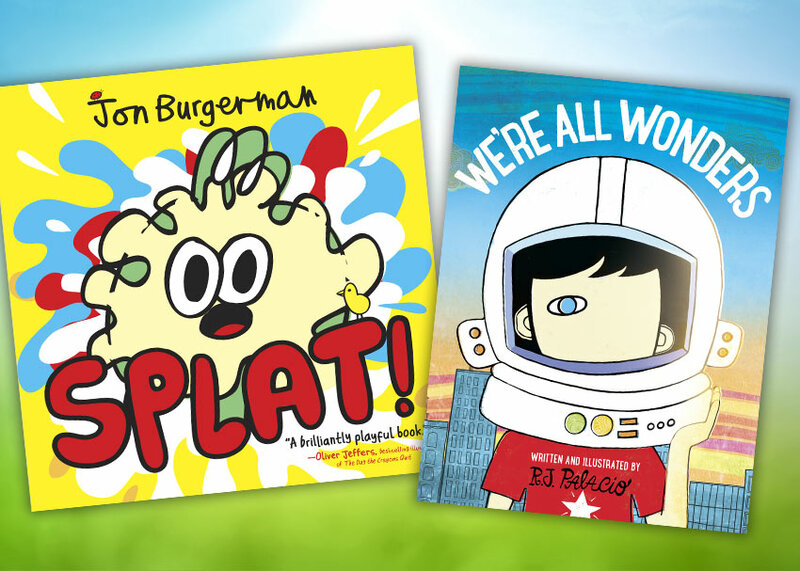 What do you get when two of the most popular children’s book creators in the world team up? A Giant Jumperee, that’s what! But … what exactly is a Giant Jumperee? That’s just what Rabbit wants to know when he returns to his burrow and hears a loud voice calling out “I’m the Giant Jumperee and I’m scary as can be!” This one will be on repeat all summer long. Did your children go nuts over the first book by this duo? In this long-awaited follow-up to Goodnight, Goodnight, Construction Site, the trucks are back and this time they have some new friends to help them take on a big project. I especially love that this one includes some female vehicles! Does your child love interactive picture books like This Book Is Magic and Press Here? Then they’ll be thrilled by this completely original story that leaves out some of the most important parts and leaves it up to them to finish it! They can use the stickers in the back of the book or any small objects from around the house and add them to the blank spots to create a new story every time. Jumping off the diving board isn’t scary at all. Nope, not even a little. But maybe little Jabari needs a little time to figure out exactly what kind of jump to do and maybe warm up a little beforehand. And a squeeze from his dad wouldn’t hurt either. This book is perfect for the child who’s facing something new and a little bit scary, whether it’s the neighborhood pool or getting ready for kindergarten. This brightly colored picture book is full of hilarious jokes that will have the whole family laughing — just the kind of book that’s perfect for summer reading. Each page shows some new joke, from getting splashed with water balloons to getting smacked in the face with a pie. Best of all, there’s no clean-up required after these pranks. You probably already know R. J. Palacio from her smash success novel Wonder about Auggie, a boy born with a major facial deformity (a movie version is being released this year too!). Now younger readers can get in on the story and the Choose Kind movement it launched with this gorgeous picture book version that Palacio illustrated herself. If your child is getting ready to head to kindergarten in the fall, this is a lighthearted way to broach the topic and discuss what they can expect as they enter school. In the style of the other “How to” books by Reagan and Wildish, this one shows the children instructing the adults on how to prepare, and it’s delightful. This has got to be one of my all-time favorite picture books and every one of my children has been completely obsessed with it. On each page, a tiger lurks in the background and the main character tries to escape, only to find himself once again face to face with the tiger. Of course, in the end, the tiger turns out not to be so bad.